When your body falls into a catabolic state, it is much harder for your muscles to grow, rebuild, and recover. In fact, your muscle tissue might even decrease in size and mass! If you want your body to remain completely anabolic day in and day out, better keep your glutamine levels high with Nutrex Glutamine Drive! Out of all the amino acids in your muscle tissue, Glutamine accounts for 60% (more or less). Every time you workout, your glutamine reserves drop significantly. When your glutamine levels reach really low levels, that's the time your body falls into a catabolic state, breaking down your muscle tissue for its energy needs. Glutamine Drive is unflavored so you can just add a scoop to any of your preferred workout drinks and shakes. It's that easy! No more large pills or nasty-tasting glutamine formulas for you! Drive your glutamine levels through the roof... start supplementing with Nutrex Glutamine Drive today! 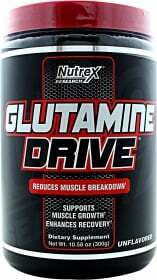 Have a question about Glutamine Drive? What is it, what does it do, how and when to use or something else? Ask us. Mix 1 scoop with 6-8 oz of water or any beverage of your choice. Take 2 servings daily: one in the morning upon rising and one before going to bed. On training days take an extra serving following your workout. WARNINGS Glutamine Drive : Do not use if pregnant or nursing. Stay well hydrated throughout the day. Keep out of reach of children.